For a brief time while I was in high school, I had to wake before dawn to catch the bus. The city where I grew up is built around a single freeway exit, and when the overpass was rebuilt it caused massive surface street traffic. In order to get all students to school on time, the district implemented a plan, which among other things involved my bus picking me up while it was still dark outside. I get the feeling this is a constant state of life for many of my students. 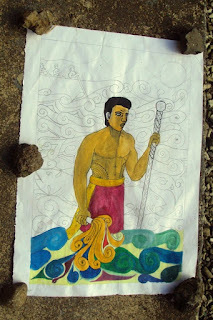 Part of this stems from the fact lots of work gets done in Samoa before dawn. With the oppressive heat of the tropical climate, people prefer to work while it’s still cool outside. A typical day for most of my students involves waking up well before dawn, and most are responsible for making the saka, boiling taro or bananas, for breakfast each morning. Every student in the country wears a uniform. Once a student is outfitted and ready, he catches a bus into town. Many students move to Apia to attend school. They often live with extended family most of the time and return to their rural villages for holidays and special occasions. So most live relatively close—at most an hour’s bus ride away. Each week one class is the duty class, which means they have to arrive early to clean the school grounds and stay after school to clean more. Morning chores involve picking up dead leaves and sweeping out bathrooms and the teachers’ lounge. The duty class arrives around 6:45 a.m., everyone else gets in sometime between 7:30 and 8:00. The first bell rings at 7:45. 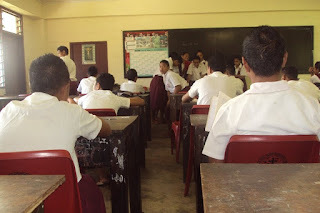 Students congregate in form room classes (i.e. home room), where one student leads a prayer and the form room teacher gives announcements. Outside, one of the student prefects blows a whistle to signal the flag being raised. Everyone outside freezes in place while another student prefect raises the flag. Once the flag reaches the top of the pole, the whistle is blown again, and business carries on. Unlike my high school where teachers had their own classroom and students moved from class to class during the day, here students stay in the same classroom all day while teachers move around. 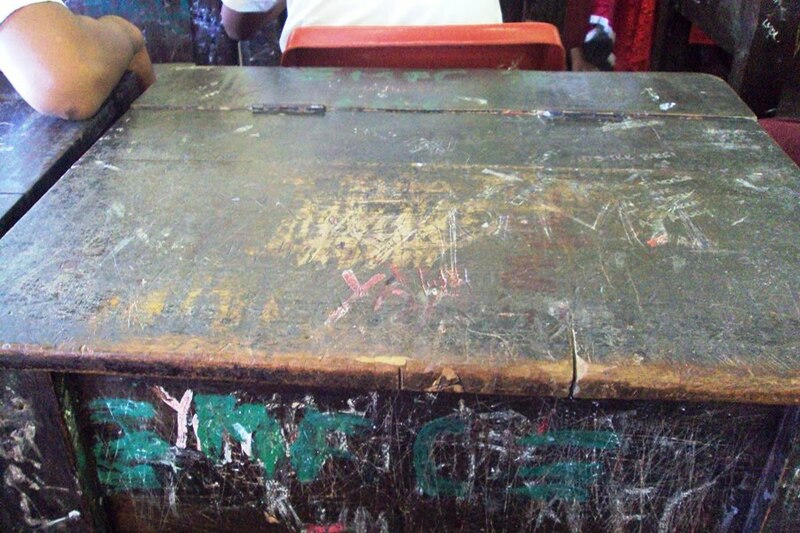 As a result, there are no lockers because students keep everything in their assigned desks. Classrooms tend to be austere. Some teachers put up motivational posters or decorate the teacher’s desk with a table cloth and flowers, but I find this has little effect. Classrooms have cinderblock walls, cement floors and chalkboards made by painting semi-glossy black paint on wooden panels. Rustic desks seem like they must have been furnished by a shop class 15 years ago. Shop class is no longer offered at my school. After school, the flag is lowered and while some students hit the road as soon as they’re allowed, others trickle out slow. Inter-school fighting has been a problem at the bus stop in town, so students are required to be out of uniform 90 minutes after school gets out. Students often have a small amount of spending money, and you can find many sitting at the tables at the market eating kekepua’a. After a while they catch a bus home. And 12 hours later, it’s time to do the whole thing over again. Painting(?) that was drying on the cement in front of 11.3 or 11.4 when I walked to school this morning. Suasami, the teacher I usually sit next to at Interval, confiscated these from some girls in 10.1 this morning. I'm unclear what this product is called in English. It's stuff you put in your hair to create temporary streaks of color. One is purple, the other is silvery white. 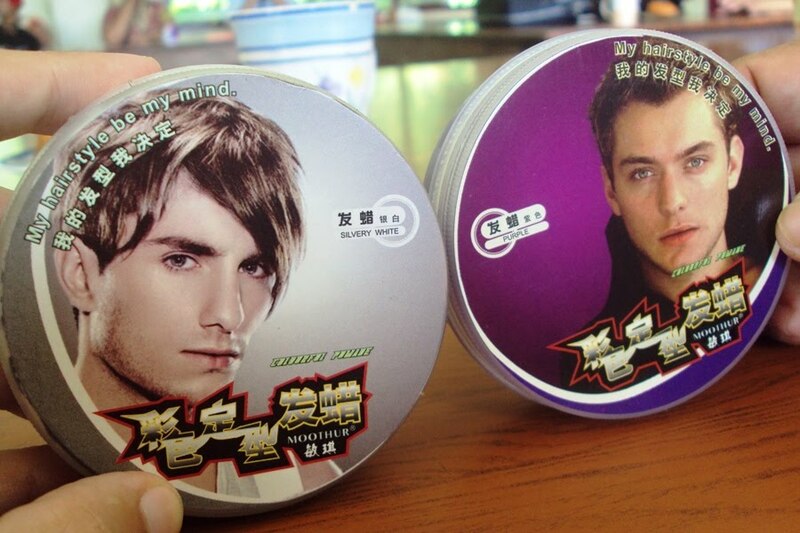 But the best part of the packaging is how it says "My hairstyle be my mind". What does that mean? The good old Samoan flag thing haha. Reminds me of my old school days. If anyone was caught moving whilst the flag was going up (or down, at the end of the day), a senior prefect would come and give you a quick lesson in respect haha.